Spanish migrant rescue charity Proactiva Open Arms said on Monday that Spanish authorities were preventing its ship from setting sail in the Mediterranean to try to save migrants. "We are blocked in a port once again. Port Authority in Barcelona denied permission to Open Arms to sail #Med Central," the charity based near Barcelona wrote in a tweet. "Preventing us from saving lives is irresponsible and cruel. Cowardly politicians are putting in place a counter for the dead," added Proactiva Open Arms founder Oscar Camps in a separate tweet. Proactiva Open Arms operates in the sea between Libya and southern Europe, coming to the aid of migrants who get into difficulties during the crossing from northern Africa. The charity's rescue ship, the Open Arms, docked in southern Spain on December 28 with 311 mainly African migrants it had plucked a week earlier off the coast of Libya after both Italy and Malta denied it entry. After stocking up with provisions in Barcelona, the ship had been due to set sail again on January 8 but Barcelona's Port Authority prohibited it from leaving, a spokeswoman for Proactiva Open Arms told AFP. 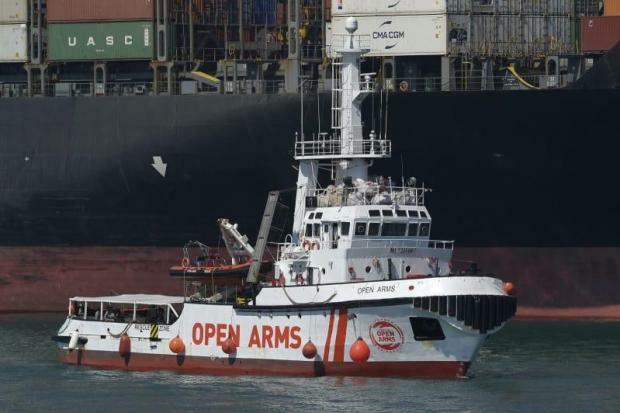 In a statement, Spain's public works ministry, which controls the Port Authority, said the Open Arms "fails to comply with several precepts of international regulations governing rescues at sea." The ship operates off the Libyan coast, a region where Spain does not have any jurisdiction in terms of maritime rescue, it added. Since the Open Arms lacks permission to dock from nations near where it operates, "it has had to cross the Mediterranean for several days to disembark rescued migrants, putting the safety of the ship, its crew and the people on board at risk," the statement added. Shortly after he came to power in June, Spanish Prime Minister Pedro Sanchez allowed the Aquarius, a boat chartered by the aid groups SOS Mediterranee Sea and Doctors Without Borders, to dock in Spain with more than 600 migrants on board. His Socialist government also allowed the Open Arms to dock in Spain but in August it refused to once again receive the Aquarius. Spain became Europe's main entry point for migrants last year, overtaking Greece and Italy, which have taken measures to prevent rescued migrants from landing in its ports. More than 55,000 migrants arrived in Spain by sea in 2018, according to the UN refugee agency UNHCR.